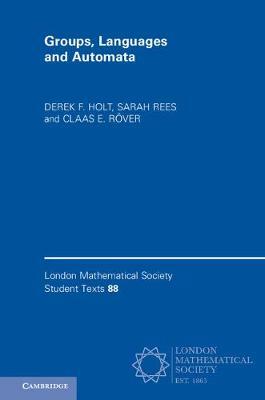 Author(s) Holt, Derek F.; Rees, Sarah; Röver, Claas E.
Fascinating connections exist between group theory and automata theory, and a wide variety of them are discussed in this text. Automata can be used in group theory to encode complexity, to represent aspects of underlying geometry on a space on which a group acts, and to provide efficient algorithms for practical computation. There are also many applications in geometric group theory. The authors provide background material in each of these related areas, as well as exploring the connections along a number of strands that lead to the forefront of current research in geometric group theory. Examples studied in detail include hyperbolic groups, Euclidean groups, braid groups, Coxeter groups, Artin groups, and automata groups such as the Grigorchuk group. This book will be a convenient reference point for established mathematicians who need to understand background material for applications, and can serve as a textbook for research students in (geometric) group theory.